Among US business angels, Esther Dyson is probably the one who has invested the most to date in Russia. Her portfolio includes no fewer than 15 Russian startups as well as Yandex, the search giant which she advises as a member of its board of directors. You speak commendable Russian, you have invested in a range of Russian companies, you often visit Russia and even went through cosmonaut training here. How does your personal Russian story start? What role does Russia play in your life? In some strange way, Russia is my second country, even though I have no Russian roots. I learned Russian in high school, because my father before me had learned it in England as a student at Cambridge, where most of his math and science profressors were Russian. And then he was involved in the US space program, which cooperated well with the Russian space program. So in our family we liked the Russian people, even though we did not like the Soviet government. Why do so many US web and tech companies come late to Russia, or do not come at all? Because many other markets are more attractive and easier to operate in. For foreigners, the language itself is a problem. Because there are so many Russians, fewer Russians have learned English than in countries such as the Czech Republic or Hungary, let alone the Netherlansds or Sweden. In this way, Russia is similar to Germany or Spain, where there is a large enough local market that fewer people learn a second language. But second, there’s a lack of business experience. Most people don’t have parents or other relatives who ran a bookstore, worked as manager, sold industrial piping or started a restaurant. Very few have been well managed, so they themselves dont know how to manage either. They don’t know how to write an email that makes it clear what kind of response they want. It’s the simple things that Westerners take for granted that are most lacking. Do you see differences between a Western and a Russian startup? The big difference is that in Russia there is much more regulation and corruption, and that it is hard to find experienced business managers (even though it is easy to find highly intelligent and qualified engineers). Is corruption an obstacle to innovation? Obviously, there’s a lot of corruption in Russia – even more than in many other countries. But fortunately, around the world, the Internet is changing things for the better. To the extent that an economy moves online, corruption usually diminishes. First of all, there is simply more record-keeping, and transactions are automated, so bribery is harder to implement and harder to cover up. Separately, so much of the Internet economy empowers individuals. It may be cost-effective to bribe a manager in a large company to give you a contract you don’t deserve, but you can’t bribe millions of consumers to buy your products or use your online service. Overall, the online economy is more efficient and allows the best players to win by pleasing customers rather than bribing middlemen. And finally, in some ways online services can reduce the costs of being honest. One of the most wonderful innovations in Russia is the online kiosks that let you accomplish a variety of transactions online – including the payment of traffic fines. Now, instead of paying a cop a bribe in cash (to avoid getting a fine), you can simply pay the fine online. In the old days, paying a fine instead of a bribe involved going to the traffic police office or more recently the bank, which added a lot of inconvenience to the cost of honesty. Most people would prefer to be honest… now it’s easier. What a wonderful thing! What is true and what is false concerning Russia’s image in US investment and financial circles? Mostly, they know very little about Russia at all, true OR false. So, they just think of it as a place where good engineers come from…. Those who have experience… Some have had good experiences, and others bad ones. What about your own experience? Can you tell us a bit about your portfolio companies in Russia? Could you tell us more, in particular, about your investment and involvement in Yandex? I’m on the board of Yandex, which just went public last May. It’s an exciting company to be involved with… and now that we are going international and scaling up, I feel I can be more helpful as a board member. Apart from Yandex, have you made money from exits from Russian startups? Yes, and I have sold only a small part of my Yandex shares. I was an investor in a company called DPI that is now part of Lanit, and also I had a one-percent share in Paragraph from founder Stepan Pachikov that did very well for me when it was sold to Silicon Graphics. What are your further plans/projects in Russia? Many… and I will talk about them in due course. 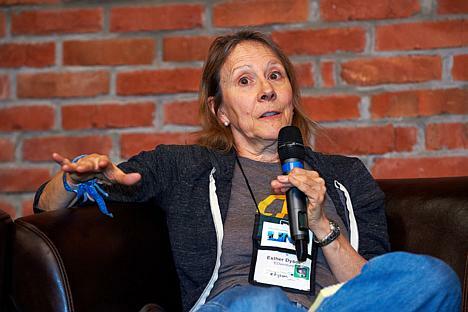 Esther Dyson (@edyson on twitter) is chairman of EDventure Holdings. Her primary activity is investing in and nurturing start-ups, with a recent focus on health care and aerospace. She recently (October 2008 to March 2009) spent most of six months training as a backup cosmonaut in Star City outside Moscow Russia. While there she had the pleasure of spending time not only with the cosmonauts, but also with some of the US’s finest astronauts. She has chronicled some of her EDventures on Flickr at www.flickr.com/photos/edyson. Apart from this brief sabbatical, she is an active board member for a variety of startups, including 23andMe, Airship Ventures, Eventful, Evernote, IBS Group (advisory board), Meetup, NewspaperDirect, Voxiva (the company behind text4baby.org in the US and Russia), WPP Group (not a start-up! ), XCOR Aerospace and Yandex (recent IPO). Her past investments have included Medstory (sold to Microsoft), Flickr and del.icio.us (sold to Yahoo! ), Brightmail (sold to Symantec). EDventure is Esther Dyson’s DBA (“doing business as”). Her portfolio includes all the companies she serves as a director. In addition, her past investments have included Medstory (sold to Microsoft), Flickr and del.icio.us (sold to Yahoo! ), Brightmail (sold to Symantec). Her current investments include AdKeeper, AnchorFree, Apiary, ChallengePost, Cognitive Match (UK), Crowdbooster, Factual, Flattr (Sweden), GoodData, GridPoint, GroundCrew, Ji Grahak (India), LinkedIn, Linqia (Spain), Payperks, PlanGo (Finland), School of Everything (UK), Skygrid, Square, SocialBon, Sparked, ThingD, Trusted ID, txteagle, Vizu; AlterGeo, Ostrovok, TerraLink, Vita Portal and Zingaya in Russia; Applied Proteomics, Genomera, Habit Labs, HealthEngage, Health Loop, HealthRally, HealthTap, Medico, Keas, Medivo, Omada Health, Organized Wisdom, PatientsLikeMe, PatientsKnowBest (UK), Resilient, Tocagen and Valkee (Finland) in health; and Icon Aircraft (light sport aircraft) and Space Adventures (which organizes programs such as hers for space tourists) in aerospace. Dyson also sits on the boards of several nonprofits, including the the Eurasia Foundation, the Sunlight Foundation, the Personal Genome Foundation, the Commercial Spaceflight Federation and StopBadware.org. She has a BA in economics from Harvard and was founding chairman of ICANN from 1998 to 2000. In addition, she wrote the best-selling, widely translated book “Release 2.0: A design for living in the digital age,” published by Broadway Books, in 1997. First published at East-West Digital News.